I am sure most everyone has heard our fun announcement already if you follow us on social media, but I thought it would be fun to share our announcement here on the blog as well along with a little recap of the first trimester! How far along now: 14 weeks as of yesterday and smoothly sailing into the second trimester! 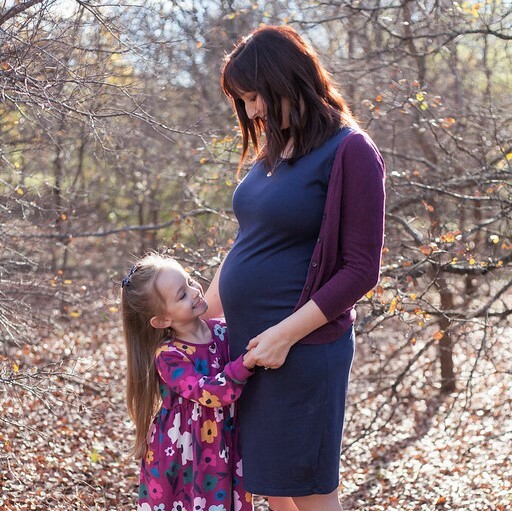 The first trimester was full of suspense and drama, just like with big sister. We had another sub chronic hematoma resulting in a lot of bleeding, worrying and prayers! Thankfully by 12 weeks, we were in the clear! Unlike with big sister who’s took 1/2 the pregnancy to clear up. How did I find out: I took Hal for a birthday party for her cousin at Chuck E Cheese just days after her birthday and I walked in and immediately felt sick! The smells were overwhelming. This was so interesting to be since that keen sense of smell was my first clue when pregnant with Hallie. Overall the pregnancies have been quite similar. Pretty soon after my exhaustion started to make a lot of sense! Announcing: We told grandparents, Big Sister Hallie and Christopher’s grandparents first. Hallie was my favorite announcement by far, when we told her she looked up at the ceiling of the Mexican Restaurant we were at and said “Thank you God!” Her sweet little prayers were answered. It was the sweetest ever! We waited until 12 weeks to post these sweet photos from Purple Moments Photography Mostly because we wanted to make sure the hematoma was clearing up! But, praise God it was actually gone! Queasy or Sick: Definitely super queasy. Just like with Hallie I have only actually gotten sick a handful of times. Smells really get to me though. And brushing my teeth makes me gag for some reason. I remember the same thing though with Hallie. Gender: Another perfect pink little girl! We decided to do the gender blood work this time and do a small Gender reveal with family. We let Hallie pop a balloon releasing pink confetti. Hallie wished for a sister, so she was really excited! Sorry Dad! Sleeping and Cravings and aversions: Already waking up several times a night with this one! With Hallie I almost always woke around 3 am. Big surprise she always had a middle of the night feeding then. The magic time this go round is 3:30, so maybe that means a 3:30 feeding. No meat for me this time! Very similar to big sis. I can only stomach chicken in small doses. Chicken salad and shredded chicken and every once in a while ground turkey is how I am getting my protein. Bacon and fish are the WORST! I am loving carbs! Bagels, pizza, pasta, and bread! I love Mexican food, cheese, pickles olives, and all the sweets I can get my hands on! At first I wanted sour and fruity candies which have now been replaced with chocolates! I also really miss my turkey sandwiches and real caffeinated coffee! Movement: I started feeling little popcornish movements here and there. Looking forward to feeling more though! We are so excited to welcome another little girl!